There are several reasons, first of all, come the nature of the videos which mean that the user needs to delete the videos so that they are not watched by anyone else. This issue is also associated with the space of the device. It means that the user wants to get more space storage once it has been made full. The unwanted videos are then deleted to get the storage space back. With complete space saving analysis embedded the iMyFone umate Free is an app that can do wonders. With just one click, the space is optimized to great extent. The presentation of the data is also awesome and the user needs no other program once it is installed. Some of the features are as follows:• The program allows the users to run more apps as compared to the other programs that are of similar genre.• The background app running is terminated and the device is also optimized to the fullest. • The tune up option is just one click away meaning that the user needs not to be tech savvy. With this program, the user need not to worry about the iPhone space saving once attached. The program is intelligent enough to judge everything altogether. Some of the features are as follows:• The iOS is stabilized by the removal of old and useless files with ease.• All issues such as freezing as well as crashing are resolved with the help of this program. • The other category that is usually oversized in iTunes is also fixed in a professional manner. • This program does not allow the user to delete any app. The advanced features clean up the space without any deletion of data. 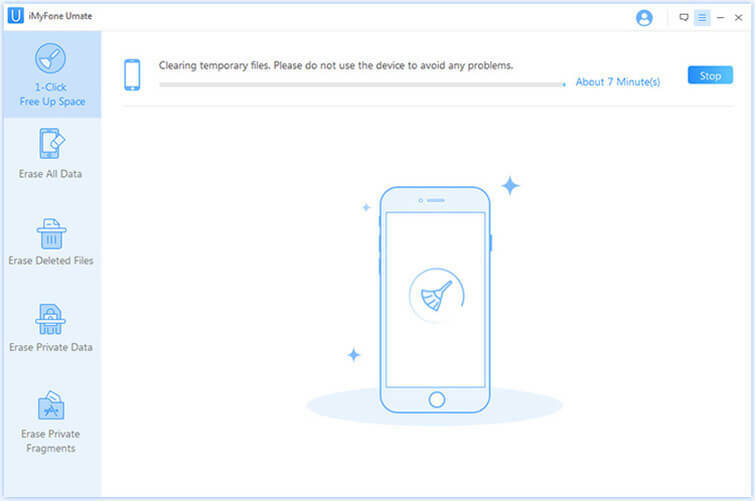 After using the free app, if you still think that your iPhone is not “clear” enough, then you may need a deep cleaning tool. 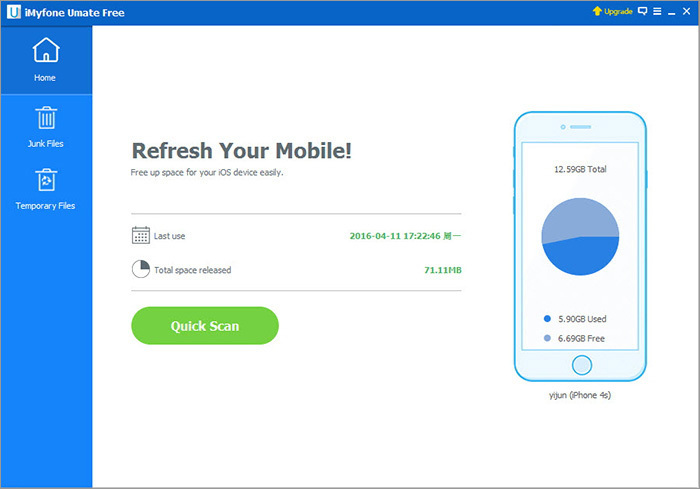 iMyFone Umate Pro or iMyFone Umate Pro for Mac is an one click iPhone deep cleaner. 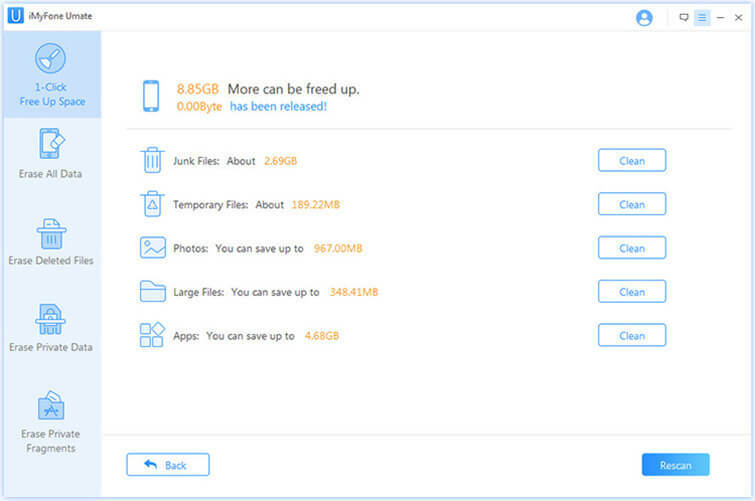 It gives an all-round deep analysis for your iPhone (iOS 12 Supported), and calculate how much space that your iPhone can be saved. 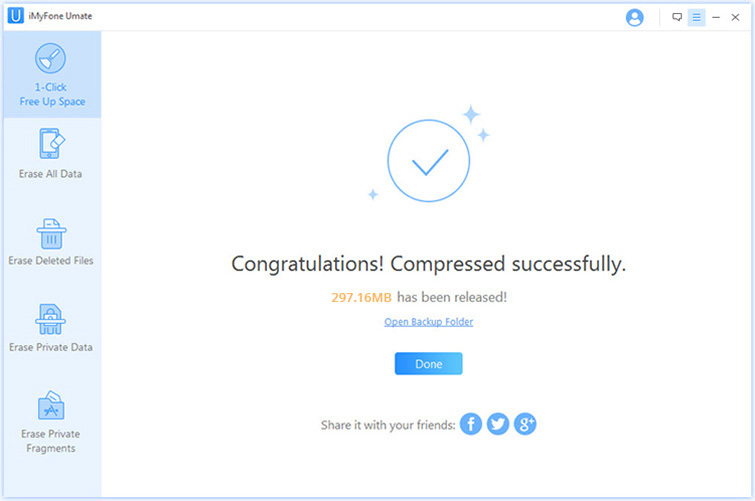 Different from Umate Free, the Umate pro delete not only junk files but also temp files, photos, large files, apps etc. It is easy to use, light and does not consume system resources. Here, we list the steps that are to be followed when using this iPhone memory cleaner (iOS 12 Supported). First of all, you should download and install the program. Step 1. The device is to be attached to the system so that the program detects it. The “Quick Scan” button is then to be pressed. Step 2. Once the button is pressed the iPhone will be scanned by the software. The space that can be saved will then be shown. Step 3. Once the clean button is pressed the user will find that the program has started cleaning. Step 4. After finished the cleaning, the program will then lead the user to home screen and the space released will be shown. There are several programs that are available in the market and they perform the task. iMyFone umate does the same as user requires. At times the user is novice and he does not know how much data is there occupying the memory. The user therefore requires a program which does the work and removes large files. This will ensure that the use gets the best outcome in relation to the idea. At times the user is unaware and there are large files within the iPhone. To curb the situation the unwanted files are to be deleted. It will show that the user gets the ultimate experience and the overall issue in relation to phone speed is resolved.